THE NEW TIMES HOLLER! is pleased to present an interview with the writer Hitoshi Yasuma, who lives in his native Japan in the city of Hannoh. He has always been involved with writing and culture; he was a high school teacher of French and English and translated French and English texts into Japanese for newspapers, books, and companies needing translations. 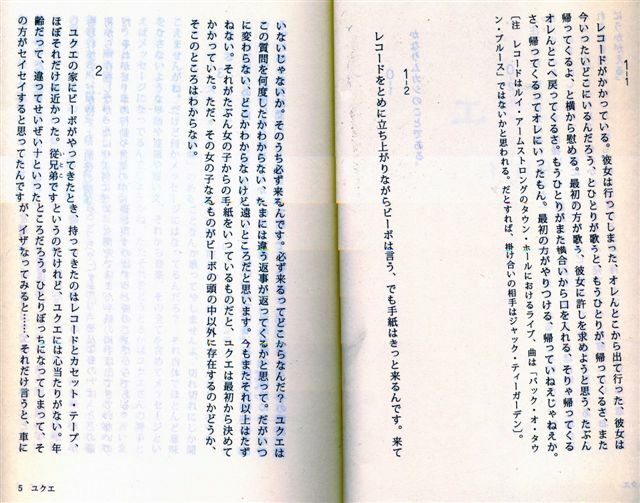 Besides his admiration for Japanese writers such as Masuji Ibuse, Shigeharu Nakano, Osamu Dazai and Saisei Muroh, he likes Amiri Baraka, Nietzhe, Charles Mingus, Oscar Wilde, Edgar Allen Poe, Archie Shepp, Baudelaire, Jackie McLean, Freud, John Tchkai, Ken Makanda McIntyre and the rest of The New York Contemporary 5; Karl Marx, Tennesee Williams, Sartre, Dostoyevsky, and others. Now in his late 70s, he has published his first book, Yukue. His weaving of varying forms of music from classical to blues, from rock to Jazz creates rich ambiences for the scenes in his book. It is interesting that he finished this project after becoming blind from molecular degeneration during the past 10 years. Yasuma has completed two more books to be published soon, and he is working on a 4th book. For these projects he has been assisted by his daughter, the alto saxophonist and composer Saco Yasuma, who now resides in New York City. HOLLER! : What are the main themes of your books? YASUMA: I want to express different lives from unconventional directions; a reflection of people's mental and emotional complexes. HOLLER! : You use music as a story-telling tool in Yukue; will you use music the same way in your upcoming books? HOLLER! : Music is an important part of the fabric of your story, the same way that it's used in film; would you like to see any of your work in film? YASUMA: I'm interested in having my work in film, in an abstract way, not conventionally, more avant-garde. HOLLER! : I've heard that at one point you played music; what kind of music did you play, and during what period in your life? YASUMA: I played alto saxophone and clarinet for Jazz and basoon for an amateur classical orchestra. That was immediately after the war, in the Ginza district in Tokyo for Japanese audiences and for the American Air Force Officers' clubs. In those days some people had a lot of money from the Black Market, and big corporation people would come to dance and indulge in sexual fantasies; for instance, one touch under a woman's dress cost 300 Yen! The Americans treated the musicians very well, although we had to work from Saturday to Sunday morning, but we had great meals. Because these were white men, if we played hot music the Japanese managers would make us play something similar to the Englishman George Shearing's quiet style. But in the Yokohama clubs, where the black soldiers would hang out, I could play "hot" music, and one night an average looking soldier tipped us 1,000 Yen so that we'd play music he could dance to, which was a lot of money then. Some parts of Tokyo you could still see the burnt buildings from the bombings. Some people would get rich from the Black Market selling American products and farmers' goods that were priced very high. It was a very chaotic time! HOLLER! : Why didn't you become a musician? YASUMA: I had to think about my future; I had a fear that American need for music might decrease and I contracted TB; both of those reasons. HOLLER! While in Japan, I had a discussion with a Japanese artist who said that during the 80s and 90s it was hoped that culturally Tokyo could become an international city like Paris, New York, London, and Berlin, but finally it didn't work. Do you agree with that? YASUMA: Japanese culture has been isolated for a long time, and those kinds of traits were obstacles to Tokyo becoming an "international" city. HOLLER! : What are the challenges that Japanese artists of all disciplines face? YASUMA: From 80 to 90% of Japanese artists are thinking about fame and they create for society's popular needs. If they want to express themselves, it's really difficult. When I went to Soho in New York, I visited a small theater that was doing avant garde plays; it was in a small room, with folding chairs. It wasn't a big, formal theater, but very easy to come by in New York compared to Tokyo. HOLLER! : Have you always been thinking about writing and publishing your work, or are you feeling it at this time in your life? YASUMA: Yes, since I was young. HOLLER! : You visited New York in the early 90s and lived for a while in Harlem; what were your impressions? How did New York compare with Japan? YASUMA: I loved it because it was funky with freedom in the air, unlike Japan! HOLLER! : After coming to New York and seeing and hearing some of the musicians and poets that you'd admired for so long, how did you like them in person? YASUMA: I saw a lot of things I wanted to see; Jazz musicians, the Metropolitan Opera, very different! Especially Jackie MClean, Lou Donaldson, Roy Haynes and Ken Makanda MacIntire, they were very impressive. When I went to the Blue Note the performance was so conventional, so touristic that I was dissappointed. HOLLER! : As someone whose interests in the arts are international, would you like for your work to be distributed and read by an international audience? HOLLER! : How was it for you to begin working on your novels as your sight was leaving you? How did it influence your determination; did it give you a sense of urgency? YAUSMA: It was inconvenient, losing my sight, but it didn't influence my ideas. I was touch typing; when I couldn't do that any longer my daughter helped me. HOLLER! : Can you tell us something about your new books, when they'll be published, will they all be novels? YASUMA: Because my viewpoint is unconventional, I don't expect people to understand my novels, so I don't think about the future, but yes, I am working on some new novels. I really appreciate the few people who read my work. 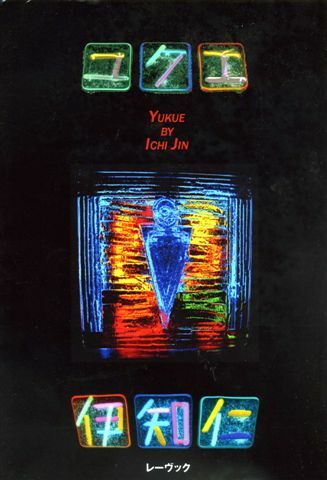 Hitoshi Yasuma's novel YUKUE can be purchased through Amazon.co.jp; his pen name is Ichi Jin, Written in Japanese, it is published by Revook. People interested in getting copies may contact THE NEW TIMES HOLLER! for additional information. For those of you who read Japanese, scroll down the photos below to sample the first pages of Yasuma's YUKUE. He opens his book with a Louie Armstrong and Jack Teagarden duet that was recorded at a Townhall concert being played in the background.